Edward Tomasso is a young professional wearing numerous hats in the fields of marketing, media, entrepreneurship, and photography. From a very early age, Edward Tomasso knew that he wanted to pursue a career in business. While enrolled in high school, he took on the role of a Social Media Manager for Dubai-based diving company Dive Advisor. The partnership was facilitated through the freelance network UpWork. While holding this position, Edward Tomasso managed Dive Advisor’s social media accounts across Twitter and Instagram. As the company’s Social Media Manager, Tomasso was responsible for developing, managing and curating unique content in order to promote the functions of Dive Advisor’s flagship smartphone application. After his first hands-on experience in working with a start-up company in its elementary stages, Edward Tomasso envisioned a career in entrepreneurial pursuits. Fuel for this desire continued when he was required to develop a product for a business class. Along with his fellow classmates, Tomasso established an idea for a convenient alternative to traditional coffee mugs. The finished product would be called Compresso: The Collapsible Coffee Cup. For this endeavour, Edward Tomasso was elected CEO of Compresso. This particular role within his small business called for the overseeing of all sales and online marketing efforts. Calling on his former experience as the Social Media Manager of Dive Advisor, Edward Tomasso strengthened his product marketing skills through this experience. 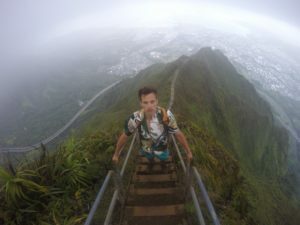 Continuing with the young entrepreneur’s insatiable desire to learn, Edward Tomasso stumbled upon the world of freelance adventure photography while traveling the globe. Originally taking up the craft as a hobby, he has since pursued the artform professionally. His portfolio boasts engaging snapshots of his adventures in Switzerland, Italy, Colombia and the United States. Edward Tomasso is happy to offer advice and mentorship in the areas of Freelance Photography, Business Management and Social Media Marketing. To barter with Edward Tomasso on the Bartering Exchange Network, visit his services pages.